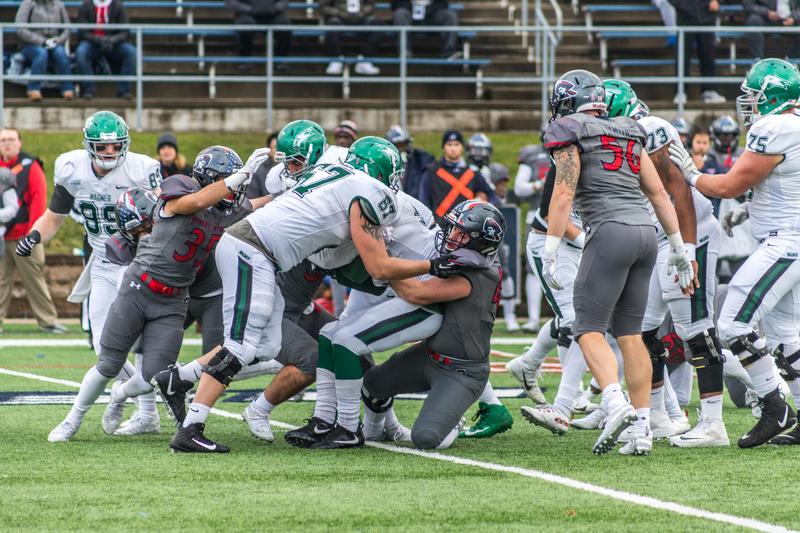 MOON TOWNSHIP— In a matchup that seemed the be the perfect recipe for a Colonials win, the result was quite the opposite as the ineffective Robert Morris Colonials (2-9, 0-6 NEC) were crushed by the Wagner Seahawks (3-8, 3-3 NEC) 41-7. The Seahawks struck first after receiving the ball at the beginning of the game when star running back Ryan Fulse took the ball in from the 15-yard line. It was just the start of an incredible day for Fulse who finished with 303 yards and three TDs. While their first drive stalled, The Robert Morris defense, which has struggled all season, came up with a timely turnover. Myles Canton made the diving catch off an errant throw from TJ Linta. The interception gave Robert Morris the ball at the RMU 46 yard-line. Robert Morris struck fast on the drive. During the second play of the drive, senior quarterback Jimmy Walker connected with freshman Dorian Bowie on a 40-yard pass which put the Colonials on the 6 yard line. On the very next play, Walker used the play action to fire a bullet right of the middle to junior tight end Matthew Gonzalez who extended the single-season school record with his 12th touchdown of the season. But unfortunately for the Colonials, that was all the offense they would create for the day. The chaos started when Wagner scored their second touchdown of the day. Off of the kick off, Wagner kicker Eric Silvester sent the ball 33 yards on a short kick. Colonials tight end Dylan Smith was there when he signaled for a fair catch. Despite the fair catch signal, Smith was immediately met by two absolutely brutal hits. One hit made helmet-to-helmet contact and both players left their feet to make the hit. Immediately, Smith went down on the play and the benches cleared as pushing, shoving and punches being thrown as referees and coaches attempted to break up the scuffle. The referees discussed once the situation was broken up and the two players directly responsible for the hit, Wagner’s Tajai Owens and Tyamonee Johnson were both disqualified from the game and unsportsmanlike conduct penalties were given to every member of each team. Off the penalties, Robert Morris would start their drive from the Wagner 35 yard line. Unfortunately for RMU, the drive didn’t turn out the way that the Colonials intended. On a third and long on the Wagner 38 yard line, while trying to get the throw off, Walker was strip-sacked by Cam Gill and the Seahawks would take back the football. Going into the second quarter, the Colonials would get into Wagner’s side of the field three times. Each of those times, a turnover would derail any chance the Colonials had at a score. Going into halftime, the Colonials would face a 38-7 deficit and from there it wouldn’t get any better for the Colonials as they would ultimately fall 41-7. Robert Morris would end the first season of the Bernard Clark era with a record of 2-9, ending their season with their second straight winless season in the Northeast Conference. And for Robert Morris football, their next action will come when spring ball begins in March.